Hey ‘Nevers! Hope you are off to a fabulous start to 20-great-teen. After a couple months in the lab, the crew has decided to make this year our most progressive yet. We have developed a nice set of smooth jazz favorites featuring hand-made wooden instruments. All tunes are of course performed party band style, so take your B-6 vitamins and stretch before the show. You may just find yourself swinging from the chandelier before the night’s over and we don’t want anyone to pull a hammy. Come join us at Montreux on February 9th to experience Zero to Never live! We look forward to seeing you at a show soon!! Zero to Never is heading down town to brave the cold (low of 61) this Saturday December 14. The original plan was to fill the town with the sounds of Christmas by doing our own renditions of Holiday favorites such as 'Silent Night,' 'Frosty the Snow Man', and 'I Saw Three Ships.' However, after taking a moment to realize that could be a disaster, the 'Never Boys decided against it. The new plan is to ROCK the town and use the power of our funky music to spread holiday cheer! 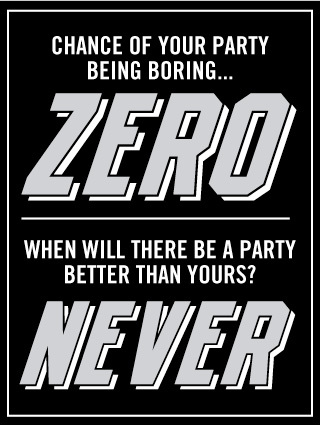 After the show, you won't see Zero to Never until 2014. So bundle up (jeans instead of shorts) and head to the Wild Wing Café Down Town Charleston on the market December 14 for the ZTN end of year party! We are pleased to announce that Zero to Never is returning to L.G. 's by the Creek for a super awesome Cinco de Mayo party. It technically starts on the 4th of May at 8:30PM, so you could refer to it as the "Quatro de Mayo" party. By the time the clock strikes 12, we will be ringing in the 5th with dancing, singing, and some margaritas. Hope to see you there! Join Zero to Never at Montreux Bar and Grille in Summerville this Saturday March 16, for a St. Patrick's Day party you won't want to miss. The festivities will be going for much of the day, but the true action will begin when the band takes the stage at 10:00PM. Rather than give a lengthy explanation of what to expect, I'll just leave a quote from the manager at Montreux: "Absolutely Insane! This is the biggest party we have all year. Even bigger than New Year's Eve. This will be one you will remember for a long time!" " 'Zero to Never', what a great name! What type of music do you play? Do you do weddings? What are some of the songs you sing?" Fans, friends, and soon to be groupies ask great questions constantly, so the band decided it was time to pull all the answers together into one site along with photos, videos, news updates, song lists and more to provide our fans with a way to stay connected and updated on latest happening with the band. Take some time to explore the site and shoot the band an email with any comments, questions, or song suggestions you may have. As the blog evolves, Zero to Never plans to make it their goal to post photos from shows that you've taken, so send anything you have and keep checking to see if your photo's makes an appearance on our site. Last but not least, a super shout-out goes to our friend and web designer Ashley Foote. A big thank you for the hard work and super awesome web site! Check back with us soon and keep on rocking!